My beloved writing group, down the pub one Monday night. About 4 years ago my first novel was halfway complete and had been sitting untouched for a year. My firstborn daughter was 9 months old and I wondered if I would ever go back and finish it. But then something magical happened. I swear it was divine providence or kismet, and it saved my writing. I found a writing group. Or, I should really say, a writing group found me. 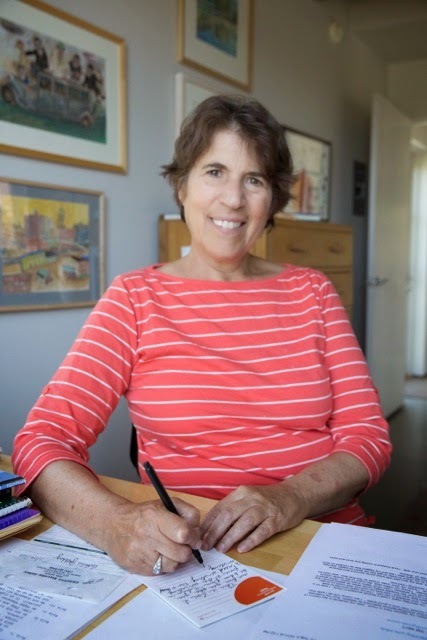 Writing guru Natalie Goldberg came to a local writer's conference and I attended her keynote lecture with two aspiring writer friends. Goldberg is a huge advocate of freewriting and she suggested finding people to freewrite with for accountability. We were all three inspired. We soon figured out that between the three of us we knew enough writers to start a group. I was a little reluctant to commit with a baby and a new part-time teaching job but thought that I could at least come occasionally. But from that first night, something happened. 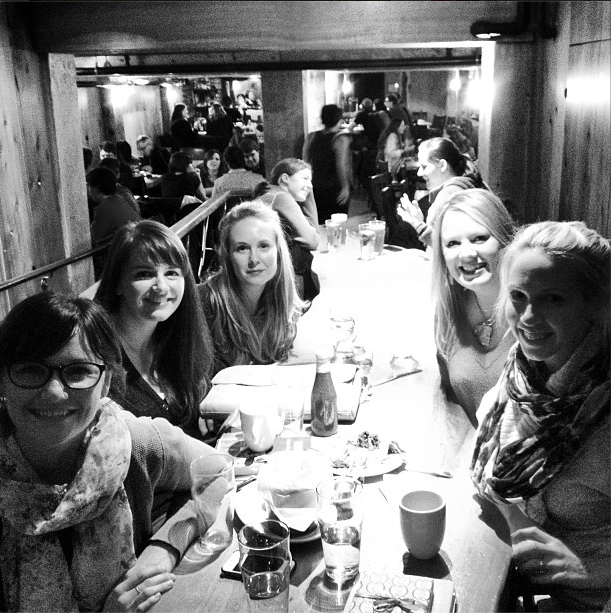 Six or seven of us showed up at an all-night diner that served bottomless coffee and pie. We freewrote, we shared aloud, we did another round, and we left inspired by each other and encouraged by our own work. I picked back up my novel and showed up to our group every Monday night. In less than a year I was attending my first writing conference and querying agents alongside two of my group members. Four years later, our group has changed, but that same creative energy, mutual respect, and accountability is still there. We've supported each other through agent querying, literary contests, and at this point several novels, memoirs, and screenplays. We've also gone on writing retreats together, implemented a book exchange at Christmas, and eaten a whole lot of pie. Sometimes we still freewrite or send something to the group for feedback, but mostly we share the writing life together, buoy hope when discouragement strikes, celebrate good news, and share whatever inspires us. I recently joined a different formal critique group. We meet every two weeks for 2 hours and the group critiques longer pieces by four out of the six of us on a rotation. I love the way that this keeps me accountable to produce new work with some regularity and receive feedback from multiple perspectives. My original writing group has become my tribe, but it can also be nice to have someone who isn't already in your corner offer their honest response to your writing. 1. 6 people is a good number, 7 max. You should be able to fit around a table or a living room together and your work should get feedback with some regularity. Agree together on whether the group will be open to new members or closed. 2. Decide what you want and find likeminded people. Critique? Accountability? Group freewriting? Submission buddies? Don’t be afraid to ask for what you need most. You all deserve to get the most from the time you are giving to each other. 3. It’s ok if you don’t all write in the same genre. The variety can be refreshing and teach you a lot about craft. But it's probably important that you really believe in each other's work if you want a group that will last. 4. Make goals for yourself and share them with the group. Sometimes just saying something aloud to another person who’s going to follow up with you is enough to inspire you follow through. 5. Make goals together. Do NaNoWriMo, submit a piece to a literary contest, attend a writing conference, or pitch to agents together. It's the Thelma and Louise approach: holding someone’s hand makes it easier to jump off that cliff. 6. Do stuff outside of your meeting times together. Think about planning retreats, inviting a local author to come talk to your group, and going to writing events like book-signings, lectures, or SCBWI meetings. We've had several authors talk to us about their journey to publication and we even had a pitching expert coach us on pitching and writing conferences. We all contribute some cash to thank our visitor and everyone benefits. 7. You’d probably be surprised by how many writers you know. Start there and ask them if they know any writers they want to invite. Alternatively, local chapters of SCBWI and most regional writing associations have critique groups that you can sign up for. I haven’t personally had any bad experiences with writing groups, but I can imagine a domineering, competitive, needy, or neglectful member could really derail the group dynamic. I’d be interested to hear from any of you who have had a difficult group experience and what advice you’d give. And what are some positive tips you’ve gleaned from your own writing group experience? I’d love to hear! Finding a writing group was similarly revelatory for me. I'd always been opposed to the idea. I'd always written alone, at my computer, free from distraction, and I'd always been pretty self-motivated as well. But then, a little more than a year ago, my friends and I started writing together. Now I have one screenplay finished and another more than halfway through, and I've never been more productive in my life. We don't critique. We don't even share really--but when someone wants feedback, someone is always around to provide. We're accountable to one another. 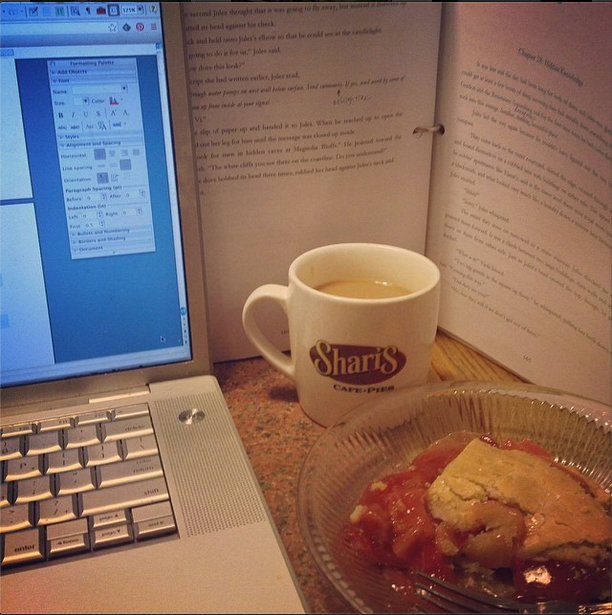 Write Club meets Sunday afternoons, and as a writer, it's one of the healthiest things I've ever done. Yes, Harrison! That sounds a lot like my group. There's just some kind of forward momentum that happens when you share your writing life in community. Love it. Guess where I'm going two hours from now? I'm retreating with my writing group! So excited to get away and spend time with these lovely souls. So glad a writing group helped you. Blogging and finding a community of fellow writers has me advance from where I was before I started.